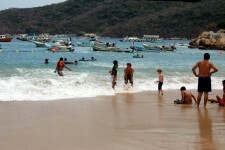 The drive from Zihuatenajo to Acapulco took most of a day and was very hot. Most of the Guererro landscape seems to be on fire. We’re not too sure if this is their way of clearing land or if some of these are accidental fires, but they are everywhere. One entire mountaintop was on fire and generally scorched to the dirt. For four hours, we stared out the window at a black hills and a smokey landscape. 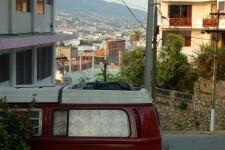 Then, once we got to Acapulco we experienced what has to be one of the craziest cities we’ve ever driven through. The streets are a complete free-for-all. We finally made it to the public beach, where we were charged to park on the street. Every open public parking spot seems to have guys waving you and then trying to charge you as if it were their property. Not wanting to return to flat tires – or worse – we eventually forked over 20 pesos so we could go cool off. At the beach, we tried to find a place to plop down our stuff, but every square inch of beach was claimed by the restaurants. They placed their plastic tables and chairs all the way up to, and into, the water so that you were forced to be their guest. There is literally no room to sit on the sand. We walked and walked and finally gave up because of the heat. I sat down at a shaded table with the stuff while Bode and Jason got into the water. It was a weekend, and the water was packed with families and boats. The wandering aggressive vendors were out in full force and I believe I got a full 2 minutes between each one. Here though, they don’t always just pass by when you say ‘No, gracias.’ They stand in front of you and wait. Or, just continue with their sales pitch unabated. The women trying to sell their massage treatments actually squirted oil on my back and began rubbing my shoulders after I had said no. After a few more ‘no, no gracias‘ and then getting up and moving chairs she finally left me with lots of dripping oil all over my shoulders. Of course, this was a pretty good sales tactic because I thought about how I should have taken that massage for the rest of the day…those few seconds did feel pretty good. To cap it off, when leaving, the waiter tried to short-change us. Tired from the drive and the hectic beach, we went to find the cliff divers and find a place to stay. The camping spots here are way out of town (through crazy traffic) so we weren’t eager to get back into the car and drive in the sweltering heat. 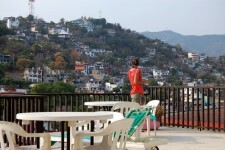 We found another cheapo hotel – this one with a marble terrace and a great view, but ‘decorated’ with plastic furniture. 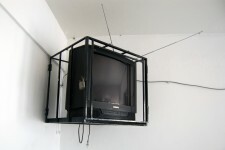 Our room featured a broken TV in a padlocked steel cage. Only the best will do. We also met up with our friends Ane, Andres and Luca at the cliff divers. The kids were so happy to see each other again. The diving was pretty impressive, but a very short show (each of the 5 divers only dove once). We planned to meet again the next afternoon and get the hell out of Acapulco. Its ludicrously hot, overcrowded, and generally unpleasant to be a tourist here. It’s tough to overcome a bad first impression. One highlight of the day was when we were walking back from the divers. We found street food that looked promising. One of those places where the cook-top takes up the entire sidewalk, so they put the tables and chairs in the street. They had tapped into the light socket of a closed business and had a small TV showing the Angola vs. Mexico soccer match. Cars would pull over to check the score or just park and watch. The quesadillas and the entertainment were awesome, and they just loved trying to explain the game to Bode. 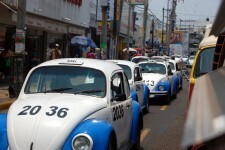 Also, we’ve seen more vochos and air-cooled VW’s here than anywhere on our trip. Well, not all México is nice. 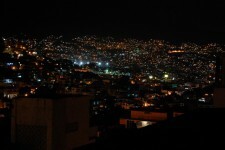 Many people of the center of the country (DF) is very tricky and tries to take advantage in every possible way. 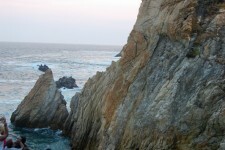 Acapulco is highly infuenced and visited for DF people because of its location. I have never been in Acapulco and I think I will never be there. More thice places to come southern. Acapulco sounds a lot like Cairo. Dirty buggers at the Pyramids just won’t leave you alone ruining the experience there too. Funny, they had a ton of busses there for taxi’s in Cairo as well. Oh well, I reckon I’ll scratch Acapulco off my list. Thanks for the heads up. Although we are traveling through the Philippines at the moment, your description of the landscape and beaches sounds exactly like what we’ve been seeing here. Whole mountain sides are on fire (I guess for clearing) and the gorgeous beaches are lined up with restaurants and karaoke bars. Is the whole world turning into this? We are still looking for our little piece of deserted beach. Good luck finding yours.